While the past decades have seen Christian congregations around the world taking on this challenge, at the beginning of the 1200s St Francis of Assisi provided Christians with an early role model for reconciliation with all creatures. He is still admired as the patron of ecologists. The environmental challenges facing us all today are far more complex and critical. There are now Christians and Christian-based organisations around the world raising awareness, forming eco-congregations, challenging materialism and over consumption and lobbying governments, politicians and big business to stop environmental destruction. 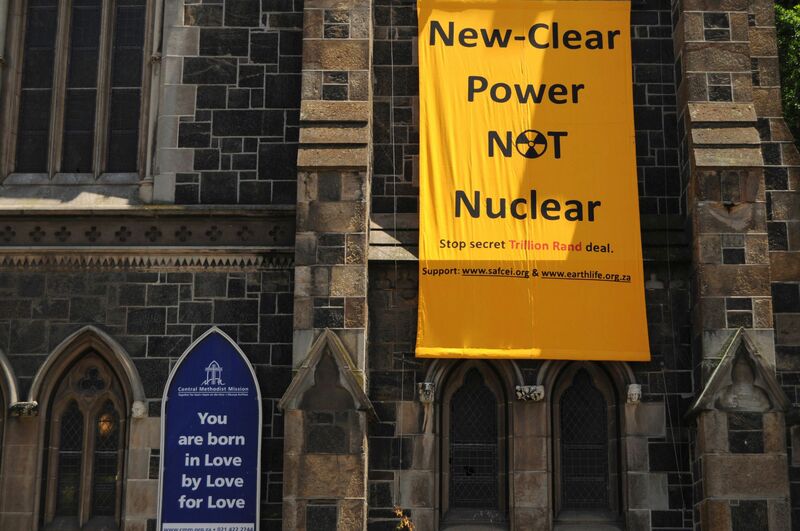 Central Methodist Mission in Cape Town displays a ‘Stop the Secret Trillion Rand Deal’ banner in support of SAFCEI’s anti-nuclear campaign in 2017. Image © SAFCEI. As can be expected with such a large faith community, a variety of views exist among the different denominations regarding the correct relationship between Christianity and environmentalism. This verse has resulted in a kind of dual citizenship for mankind, both as a part of Creation, but on a higher plane than nature. As a result, some denominations keep the focus on humanity as served by nature and respond to environmental concerns within a framework of Creation Care. Others acknowledge a closer interrelationship between mankind and nature and emphasize the ecological responsibilities of Christians as stewards of God’s Creation. They see nature as having an independent value from the services it renders to mankind because nature essentially belongs to God as his Creation and the expression of his power and love. The challenge to all Christians is to discover anew the truth that God’s love and liberation is for all of Creation, not just for humanity, and to seek new ways of living that restores balance, justice and hope to our endangered planet.